The Sapallas were a peaceful and prosperous people who were invaded by the belligerent Karis, enslaved and reduced to misery. Choque, a young descendant from the last Sapalla cacique refused to acknowledge this state of things and cried out for help from the father of the gods, Pachacamac. He heard young Choque’s petition and showed him some seeds from a plant unknown to men of that time, telling him to plant it and eat its roots, but never touch the sprouts, flowers or leaves, as they were poisonous. The Sapallas did as they were told, but the Karis found the new plantations, confiscated them and ate everything the plants produced, except for the roots. As a consequence, they became ill and debilitated, prompting the former slaves to rebel against them and expel them from their land. The new plant was then considered as a divine gift, and called papa (potato). Potatoes were first farmed between 7000 and 10,000 years ago in Peru and Bolivia. 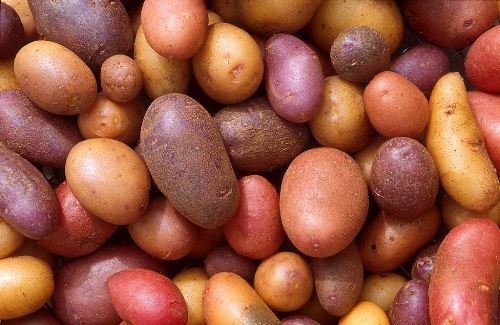 Today there are over 5000 varieties of potatoes in the world.